An interesting Miller lamp, striped of all un-necessary frills and fancy this lamp is true to form and as the name suggests was for the workplace. Its large volume font would have ensured a long burner time before it would require re-filling. The burner, a different version to the more common burners, is solid and clearly designed to withstand knocks. Given that the No.2 burner was renowned for its brightness and relative economy was therefore ideal for the work environment. A workplace would have had many of these lamps, quite possibly one per employee. Hanging from the wall it was well clear of the work space. Again, like the ‘Home’ lamp it is made from the cheapest materials and is comparatively an ‘ugly’ lamp. 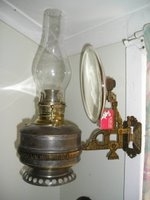 The photograph shows an original cast iron wall bracket and mercury reflector which would further increase the light output of the lamp. A lamp found in factories and workplaces. This small elegant wall lamp is designed to be suspended and is based on the ‘No.0 table lamp’ but the stem and base has been removed. This lamp is designed to sit in the cast iron ring which in turn is mounted on the wall. This one is of high quality, being distinctively embossed. These were a luxury item and were usually found in entrance foyers of the better Victorian Houses. These lamps also exist as 'Tiny's' (the smallest), No. 1's and the larger No. 2's which would have been wall lamps for a large room. The ‘zero’ burner was used on a number of smaller ‘Miller’ lamps but apart from their ‘Student’ lamp, which was designed to sit very close to the book being read. They were designed only to lightly illuminate a room and were very economical. As an alternative the lamp can display with a 6” dome milk-glass shade on a small tripod fitted below the burner. This one is fitted with a small 2¼” ‘basket’ at the top of the burner (in the same way that the larger ‘Miller’ banquet lamps hold there 4” ‘globes’ or ‘tulip’ shades). As the burner on this lamp is small it is only rated to 25 candle power and the font holds 1 ½ pints (710 millilitres). When set on an ‘average’ flame height it will burn for 8 ½ hours before re-filling. Like all such ‘Miller’ lamps, this burner has a raising device allowing for it to be lit without removing the shade or chimney.